Created for Teddy Bear Scene this one off bunny was made as a reminder of a bunny my spouse had as a boy some 50 years ago. Peter is soft, cuddly and very very sweet. 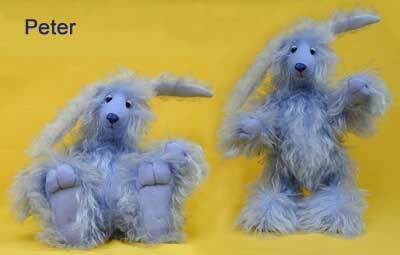 43mm pile hand dyed mohair with Schulte tipped blue mohair on ears and tail. Sky blue ultrasuede in ears and for eyelids plus Wedgwood blue for paws and feeties. Sack of glass beads in his tummy, hi loft polyester everywhere else. Soft sculpted face and paws providing pulled toes on feet and paws and dimpled footpads.